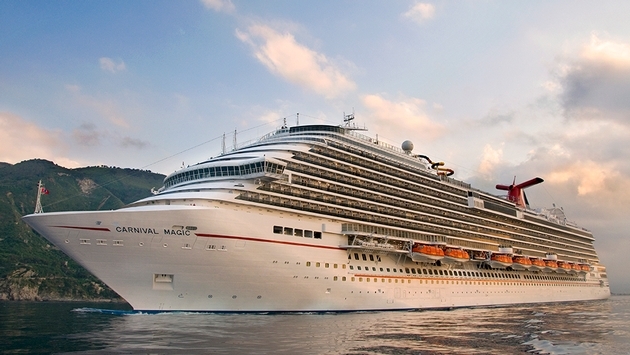 The healthcare worker who was quarantined aboard the Carnival Magic is not infected with the Ebola virus, a blood test confirmed Sunday. The cruise ship returned to Galveston at about 4:30 a.m. Sunday and the Texas lab supervisor disembarked with her husband within a half-hour. By 10:30 a.m., the rest of the passengers had vacated the ship. Although not required or requested by health authorities, the ship was undergoing “a very comprehensive and aggressive cleaning and sanitizing” before guests started boarding for the next voyage at 1 p.m. Carnival said it had "just a handful of cancellations" and that about 4,000 passengers were expected to board on Sunday. The healthcare worker submitted to a blood test required by Texas health officials prior to the ship’s arrival in Galveston, according to a Facebook post by John Heald, Carnival’s senior cruise director. The blood sample was picked up from the ship by a Coast Guard helicopter on Saturday. Despite some media reports of a “panic” onboard the ship, Carnival maintained guests responded calmly to the captain’s communications about the Ebola concern. The lab supervisor for Texas Health Presbyterian Hospital, where a Liberian man died from Ebola and two nurses became infected, boarded the Carnival Magic before she was placed under “active monitoring category” based on changes in CDC protocol. Carnival said she had been “self-monitoring” by taking her temperature until the cruise line was notified of the situation by the CDC and she was isolated in a cabin with her spouse. She never did exhibit any symptoms of Ebola, and the 21-day incubation period ended on Sunday. Although the worker did not have any direct contact with the Ebola-infected patient, she might have handled lab samples at the Dallas hospital. Belize authorities did not allow the health care worker to enter the country and then Mexico refused clearance to the entire ship, so it then headed back to Galveston.